Calibrate the geodetic style data through instrumental delay removal. Compute the Multi-band Delay (MBD). The MBD is a function of a variable clock delay, and a troposphere term (zenith path delay) which has a well-defined function of elevation (called a mapping function), times an unknown constant. Use the AIPS task DELZN to fit the MBD and calculate the clock and zenith path delay error. Apply these corrections to the dataset that includes the target. Image the target and see an improvement over not doing the geodetic calibration. This guide only gives the important inputs to each task. The other inputs should be left at their defaults. An easy way to set all the inputs to the default in a task is to type "default taskname". getname (getn) catalog #: get the name of catalog # and fill in INNAME, INCLASS and INSEQ. Other similar: geton (get outname); get2n (get in2name); get3n (getin3name) etc..
To obtain the data, right click on these file names below and select "Save Link As..." . Put the data into your $FITS area, which should be an AIPS area that is automatically set up when you install AIPS. BM272HC.fits (12 GB): Data containing target and calibrators. BM272HC_geodetic.fits (0.3 GB): Data containing geodetic block. 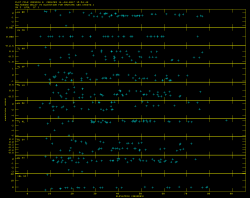 These are observations of many calibrators around the sky. The geodetic blocks are in a different file from the target because they have very different frequency setups. The geodetic block is required to have widely spaced frequencies with a single polarization in order to measure the multi-band delay (MBD). The target dataset is dual polarization (important since the source is circularly polarized) and frequencies that are continuous. MAKE SURE YOU ARE RUNNING THE CORRECT TASK ON THE CORRECT DATASET! J2007+4029, 20330+40003, 20327+40396, 20324+40574 - calibrators that are phase referenced to AFGL2591 (note that only J2007+4029 and 20330+40003 are detected). The BM272HC_geodetic.fits dataset contains numerous sources (all known quasars) observed all over the sky but the specifics are unimportant. Start AIPS by typing aips or possibly aips tv=local:0.0 in a terminal window. Depending on your AIPS installation, you might be prompted to pick a printer, then you will be asked for an AIPS number, if you are not sharing disks with anyone pick any number other than 1. Remember that number because the data you load and work on will be under that number. It would be best for this tutorial for you to use a clean AIPS number, in other words, an AIPS number that you have not used for anything else and has no data loaded into it. Load the data with FITLD. Note that I am forcing an outname, outclass and outseq, we are doing it here so it will be easy to take about specific files. datain 'FITS:BM272HC.fits ➜ Two things to note: 1) this assumes that the data is in the $FITS directory, you can use a full directory path (e.g., datain '/home/mydata/BM272HC.fits) or another environmental variable if the data is elsewhere; 2) The lack of a close ' is not a typo, you must leave off the closing ' or AIPS will capitalize the everything within the ' ' and you will get an error because FITLD will not be able to find the data. Now load the geodetic block, this is a good place to talk about global inputs. Once you set an input it will stay set for all tasks until you change it. So notice below we do not set clint, outclass, outseq or outdisk, this is because we want the same values as above and they are already set. datain 'FITS:BM272HC_geodetic.fits ➜ again remember to leave off the close '. Note each file has a catalog number (Cat), BM272HC.UVDATA.1 is catalog number 1 and BM272HC GEO.UVDATA.1 is catalog number 2. These catalog numbers can be, and usually are, used to fill in IN and OUTNAMES etc., using getn, geton etc..
Look at the structure of the data with LISTR. 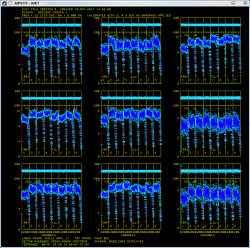 This will give you a listing of the scans as well as the source and frequency structure in the observation. 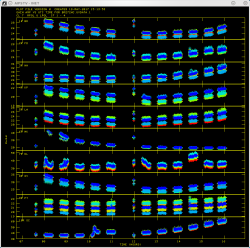 Load in the VLBA data reduction procedures: see EXPLAIN VLBAUTIL for full description of procedures. Fix ionosphere contribution to the dispersive delay by running VLBATECR. Fix earth orientation parameters by running VLBAEOPS. Correct sampler threshold errors from correlator by running VLBACCOR. Plot of amplitudes (bottom) and phases (top) for source 3C345A . Now lets take a look at the fringe finders by running VLBACRPL. 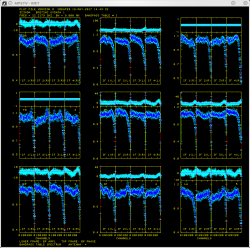 VLBACRPL runs POSSM and displays the spectrum of each baseline (to Fort Davis (antenna 2)), with the amplitude on the bottom and the phases on the top. Find and remove instrumental delay by running VLBAMPCL. Plots for source 3C345A which show the amplitude (bottom panel) and corrected phases (top panel), for each IF in both polarizations. calsour '3C345A' ' ➜ strongest source. timer 0 07 35 28 0 07 37 09 ➜ scan with good fringes we found in POSSM plots. refant 2 ➜ choose reference antenna from in the middle of array, FD (antenna 2) is a good choice. For this step there must be no failed solutions. Failed solutions in this step means that whichever antenna the failed solution was on is deleted from your data. For this data, because there are 10 antennas, 2 polarizations and 4 spectral windows (IFs), there should be "80 good solutions". 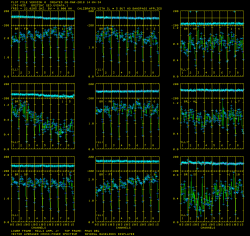 As you can see from Figure 2, the phases for 3C345A have been flattened and the phase jumps between the IFs are gone. For other sources farther away in time the phases may be different from 0 but there will still be no phase jumps. Plot of bandpass for source 3C345A . calsour '3C345A' '3C454.3A' ➜ use both very strong sources as bandpass calibrators. Figure 4 shows the amplitude gains change over time as the sources rise and set, with higher gains at lower elevations. Because 3C345 and 3C454.3 are so strong, they will increase the gains. The different IFs and polarizations (RR and LL in this case) are shown as different colors. EDITR plot showing a high data point for baselines 01-10 that we will need to flag. EDITR plot showing the cutoff area for the FLAG ABOVE option. Every data point above the cutoff line will be flagged. 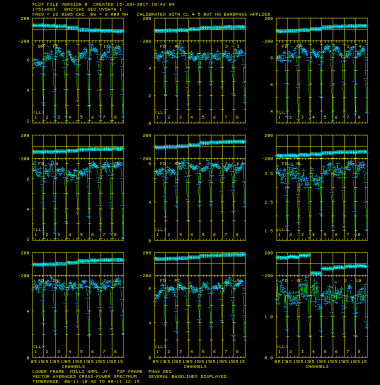 A "REPLOT" of baseline 01-10, after flagging of the high data point and re-scaling. Choose where to place your cutoff line as seen in Figure 6. Every data point above this line will be flagged. Press "C" to flag the high fluxes and return to the menu. The data points should now be highlighted white. To view the results of the flagging, we can generate a new plot by clicking "REPLOT" and pressing B. The plot will update without the high data points as seen in Figure 7. There are two more baselines with similar problems. Click NEXT ANTENNA and button B repeatedly to examine all of the data. When bad points are found, click NEXT BASELINE and button B until the offending baseline appears in the edit window, and then click FLAG ABOVE with button B to remove the bad samples. Finally, on the left menu, click on "EXIT" then press B. This will write the flags to a new flagging table (FG) which we can later apply to the data. EDITR plots both amplitudes and phases, so this is a good way to just look at your data. If you plot the phases on all the baselines, note that you can see coherent phases on J2007+4029, but not the other two sources. 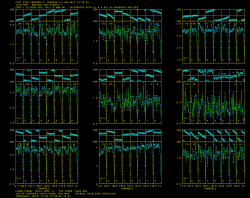 AFGL2591 has strong masers that fringe, but EDITR is plotting all the channels averaged. We will want to save the calibration up to this point with TASAV. TASAV makes a new file with all your calibration tables, this is very useful because it contains everything you need to recalibrate your data in a very compact and portable form. It is also a good idea to do this before you do anything you are unsure about or will change important tables (AN, SU) in ways that are hard to change them back. In the next step we are changing the SU table. Note that there are 8 calibration (CL) tables and 4 solution (SN) tables. As well as numerous other tables with information about your data (history (HI), frequency (FQ), antenna (AN), system temperature (TY), bandpass (BP), flag (FG)...). We will now shift the position of AFGL2591 with CLCOR. 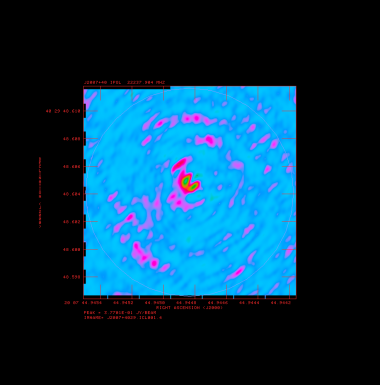 The observed/correlated position of AFGL2591 was quite wrong and shifting a large distance in the image plane is imprecise, therefore it is important to shift the uv-data with either CLCOR or UVFIX. Normally you would reduce and image the data to find the shift. clcorprm(5)= 0.009 ➜ Correction in RA direction in seconds of arc. clcorprm(6)=-0.129 ➜ Correction in Dec direction in seconds of arc. Note: If you do something wrong in this step, just doing the same shift in reverse will not undo the shift to astrometric accuracy due to the complications of precession. This is why we did the TASAV step. To undo the shift, delete the CL table that was created by CLCOR and the SU table using EXTDEST. Then copy the SU table from the TASAVed file with TACOP. Apply all calibration up to this point and copy out IF#3 with SPLAT. The masers are in the 3rd IF and we will be fringe fitting on that maser so we should get rid of the other IFs. We could have gotten rid of the other 3 IFs earlier, but I kept them around for two reasons, 1) I wanted you to see what more than one IF looked like in displays and editing, since most of the data you will receive will be more than one IF; and 2) it is a good idea to apply the calibration after the position shift, but before global fringe fitting and the zenith delay correction. For the next 4 steps you will be running the AIPS tasks on the dataset out of SPLAT. Lets look at the catalog again. BM272HC.SPLAT.1 is catalog number 4. Also if you see a gap in the catalog numbers, say BM272HC.SPLAT.1 was catalog number 5, then type recat, and it will remove any gaps. A plot showing the maser in channel 145. Select channel for global fringe fit with POSSM. We really only need to look at one spectrum for this, so you can hit "D" right away or go through a few plots to see how the spectrum changes a bit from baseline to baseline. Figure 8 shows that the maser is strongest in channel 145 on a baseline FD-HN. Perform a global fringe fit with FRING. The following steps through imaging are not strictly necessary since we will have to redo them once the geodetic calibration is done, but is an excellent way to check that the calibration up to this point is correct. calsour 'AFGL2591' ' ➜ do a global fringe fit on maser. You should get something similar but not necessarily exactly the same numbers of good and failed solutions. A small percentage of failed solutions are fine at this point. Hint: We will have to do this exact same step after doing the zenith delay calibration so it is helpful to save the inputs to FRING. This can be done with vnum and vput. Note that this is "phase referencing", you are getting phases on one source and applying them to another, nearby source. However the way we are doing it here is a little backwards, in most situations your target it too faint to use in FRING and you run FRING on one of the calibrators and apply those phases to your target. Here we are using the target maser in FRING because it is stronger and applying it to the calibrators because we care about positions. In this case any shift in the position of the calibrators will indicate that AFGL2591 has moved. Interpolate the fringe solutions with CLCAL. gainv 1 ➜ CL table with all the calibration. gainu 2 ➜ CL table to write next step of calibration in. snver 1 ➜ contains final fringe fit. interpol '2PT' ➜ use 2PT interpolation. sour 'AFGL2591' '20330+40003' 'J2007+4029' ➜ sources to which to apply calibration. calsour 'AFGL2591' ' ➜ phase calibrator, phases will be applied from AFGL2591 to itself, 20330+40003 and J2007+4029. docal 1; gainu 2 ➜ apply calibration; from CL#2. sour 'AFGL2591' '20330+40003' 'J2007+4029' ➜ split out target and phase calibrators. 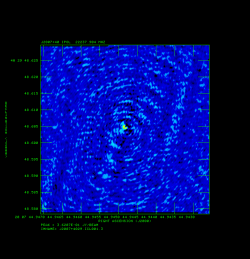 A radio image of the maser AFGL 2591. Image AFGL 2591 with IMAGR. bchan 125; echan 150; nchav 1; ➜ image channels 125-150.
cell 3e-5; imsi 1024 ➜ cell size of 0.03 mas; image size of 1024x1024. dotv 1; niter 1000 ➜ do interactive clean; with 1000 iterations. im2parm 10 6 9 0.5 ➜ autoboxing, only do 10 boxes per major cycle; find islands with > 6*rms; box is accepted if peak > 9*rms; box is accepted if its peak brightness is >0.5*max residual. To look at it use TVLOD (getn 10; tvin; tvlo). Use TVPSEUDO to put it into color (tvps). You can use your mouse to manipulate the colors, looking again at your terminal for instructions. Hit "D" once it looks the way you want. Figure 9 shows the SQASH result. Image J2007+4029 and/or 20330+40003 with IMAGR to make sure phase referencing worked. bchan 0; echan 0; nchav 256; ➜ average all channels. cell 3e-5;imsi 2048 ➜ larger image size because sources might not be at center of field. Here I would check that the autobox looks OK (It should just be around the the obvious emission) and then hit TURN OFF DOTV ("A"). Figure 10 shows the end result of running IMAGR on J2007+4029 (getn 6). To image 20330+40003 you will need to set IMSIZE to 8192. The assumed coordinate for this source was not entirely correct. 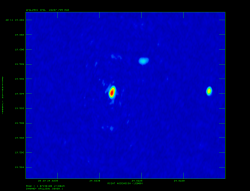 A radio image of J2007+4029. Then getn 12; tvin; tvlo; tvps. The following contains instructions for the geodetic-like calibration to improve astrometry (and phase referencing). We start with the same steps 4-8 as above on the geodetic data. Its name should be something like "BM272HC GEO.UVDATA.1" if you followed the naming I suggested in the FITLD step above. 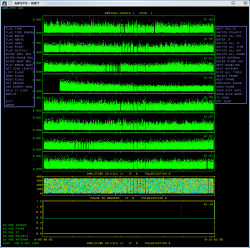 Cross power spectrum plot of 1743-035 showing strong fringes. 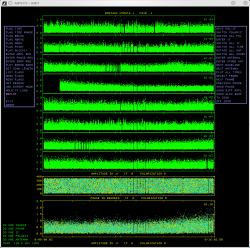 Now find a scan that has good fringes on all the baselines by running VLBACRPL. 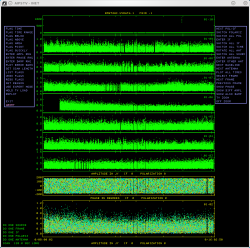 VLBACRPL runs POSSM and displays the spectrum of each baseline (to Fort Davis (antenna 2)), with the amplitude on the bottom and the phases on the top. Hit "B" a few times to go through the scans. Although there are several sources/scans to choose from, I choose 1743-035, which has strong fringes on all baselines as seen in Figure 11. Cross power spectrum plot of 1743-035 showing phase corrections. Find and remove instrumental delay by running VLBAMPCL, that runs FRING and CLCAL. 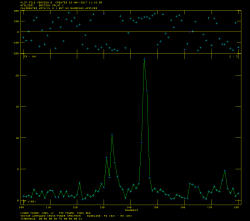 timer 0 7 15 8 0 7 16 01 ➜ scan with good fringes we found in POSSM plots. First check you have no failed solutions. At the end of the FRING run it should tell you how many "good" and "failed" solutions it has found. For this step there must be no failed solutions, failed solutions in this step mean that whatever antenna the failed solution was on is deleted from your data. For this data there should be "80 good solutions". Again hit "B" a few times. As you can see from Figure 12, the phase jumps between the IF's are gone. Some sources will show a general phase slope across all the IF's. This is the multi-band delay that we will measure and fit for the zenith delay. Determine multi-band delay (MBD) by running FRING. This will take a few minutes. aparm(5)=2 ➜ solve for the MBD. Multi-Band delay plot showing offset points that will need to be flagged. 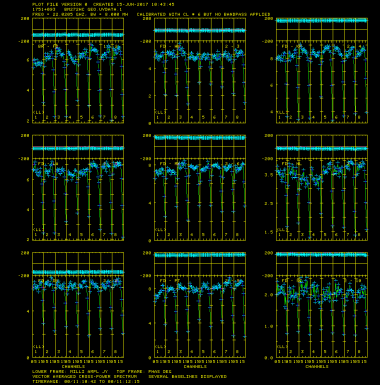 xaxis 2➜ plot verses elevation. It is important that the MBD be correct because the fitting in DELZN can easily go wonky. Figure 13 shows the resulting plot generated by SNPLT. Note that most MBD are between a fraction and a few ns. Large ones are probably wrong and should be clipped. There also should be a general trend from low to high elevations, although this is not always clear in the plot. The most obvious classic case is for SC as seen in Figure 13. Make note of the obviously bad points. Here, in Figure 13, there is one at BR (antenna 1, -3 ns), one at NL (antenna 7, -6 ns), two at PT (antenna 9, -3 ns), and one at SC (antenna 10, about 19 ns). Your solutions may vary, but you should get something qualitatively similar. Edit the MBD with SNEDT. SNEDT will only plot versus time, which is why we noted the bad points above. Flag the points noted above. After having removed the bad points and exiting, a new solutions table (SN #4) should have been created (check with imh). Check MBD again with SNPLT. Looks OK, maybe some more flagging needed (SC with a data point at -4 ns), but lets see how DELZN does. 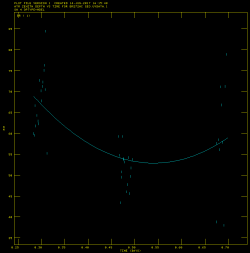 Polynomial fit plot (PL 1) for the Brewster VLBA antenna, which is generated by running DELZN. Solve for zenith and clock delays with DELZN. gainv 5➜ CL table to copy and correct. aparm 0 3 2 1 1 10➜ plot zenith atmos. delay; use 3 polynomial terms to fit atmosphere; use 2 polynomial terms to fit clock; create CL table; correct both atmosphere and clock; use 10 iterations of robust fitting. outfi 'FITS:delzn.clor ➜ file to read in with CLCOR; note if you leave off the closing ' the outfi retains the case. dotv -1➜ don't plot to TV, only make PL files. The generated plot files can be viewed with TVPL. The plots should get displayed on the AIPSTV display (Figure 14). Hit "D" to scroll through the plots. DELZN makes plots that I don't find particularly useful to evaluate the quality of the fit. The best way to evaluate this (other than applying it to the astrometric data and see if it improves things) is to apply the CL table that DELZN produces to the GEO data and see if it flattens the MBD across all the IF's. where the source and time range have been chosen to illustrate the differences clearly. After scrolling through the plots by pressing "B", or exiting with "D", generate plots with CL 6. Compare the phases to the same source when applying CL 6. As you can see in Figure 15b, the results look quite good after applying CL 6. POSSM plot showing source 1751+093 after applying CL table 5, which shows a slight phase slope across IF's. POSSM plot showing source 1751+093 after applying CL table 6, which shows improved flattened phases across all IF's. Now we transfer these solutions to the target dataset. This is where it gets a little complicated (although not much). Now we must apply the solutions we derived above on the GEO data, to the original data with the target in it. The target data should have all the calibration done except the final fringe fit (CL table version 1). Then we can compare two versions/methods of this data reduction: images of the target data with previously final fringe fit done (CL table ver 2; non-DELZNed data), with the images of the target data to which we transferred the GEO solution (DELZNed data), and see which one is better. Use "imh" on the multi-source TARGET (SPLATed) data to see how many CL tables there are (two - if you followed this guide to the letter). We want to apply the DELZN solution to the CL table immediately before the final fringe fit we performed to that data. Apply the zenith delay correction with CLCOR. opco 'atmo' ➜ read in a file of atmospheric and clock delay corrections and apply them to the given CL table. gainv 1; gainu 0 ➜ input CL#1; generate a new CL table (CL 3). infile 'FITS:delzn.clor ➜ file with corrections we created earlier with the GEO data. CLCOR will say it has created CL table #3. Use this for further calibration, i.e. skip CL#2. Now, do the global fringe fit with FRING on the DELZNed target data. This is where vput/vget come in handy, if you didn't do the vput, then repeat step previous FRING done on BM272HC.SPLAT.1 (Section 6.17), but change the gainuse parameter as shown below. Apply calibration to tables with CLCAL. Again, either use vnum/vget, or repeat CLCAL step from above (from Section 6.18), changing parameters as shown below. Apply calibration to data with SPLIT. Here we can use tget because SPLIT has not been used since the last time we ran it on this data. Again repeat step 6.19 if you can't do this. Use the correct catalog number for J2007+4029 DELZN version. It was 17 on my disk. Then run IMAGR and compare the new image to the one made without the correction (Figure 16a). IMAGR screenshot showing source J2007+4029 before applying DELZN delay corrections and before applying fringe fitted calibrations. IMAGR screenshot showing source J2007+4029 after applying DELZN delay corrections and applying fringe fitted calibrations. Peak flux has increased and position has been corrected. As you can see, the image after the correction (Figure 16b) has a lower noise level and a source with a higher peak. Bad phases spread the flux around the image and make the noise level higher and source flux lower as well as shifting the position of the source. This page was last modified on 17 July 2018, at 11:18.